Other countries issued similar labels in their native language, i.e. "Par Avion," "Correo Aereo," "Luftpost," etc. 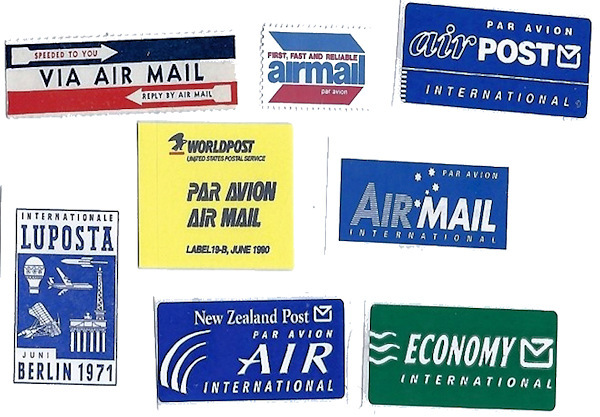 Here are a few examples of airmail labels, some are called airmail etiquettes � often shortened to simply etiquettes. Photos and images found on this Web site are the property of the American Aviation Historical Society or have been reproduced with permission of the copyright holder. They are presented here solely for your interest and education and may not be used or otherwise reproduced without the written permission of the American Aviation Historical Society.